Came across this timely little gem in a used book discarded from the Vancouver School of Theology, the first English printing of a little book called Last Testimonies, by Karl Barth. The quote below is from an interview and the discussion topic is liberalism in the classical sense, not the political sense. 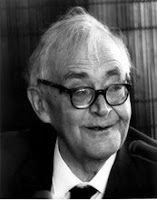 After appropriate distinctions are made, including Barth's warning to always beware of anything that becomes an "ism", the interviewer asks about political liberalism and Barth's involvement in politics. Barth describes himself as pragmatically, though not ideologically, socialist. Then this exchange comes, which may or may not provide small comfort to my American friends. Interviewer: Socialism and liberalism are presented as opposites, at least in Switzerland and just before elections. I think this antithesis has become historical, to put it guardedly. Interviewer: Would you say that being liberal has nothing or not very much to do with political liberalism but that it is more a human attitude which cuts across all parties? what paper, don't we? ...But let them go their way in peace.